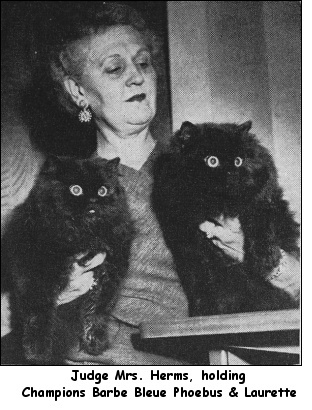 Mr. Gebhardt has been breeding Black Persians for some time under the cattery name of Silva-Wyte, and is considered an authority by Persian Cat Fanciers. He was accepted to the list of CFA judges at the age of 22, and judged with CFA for over 50 years, as well as serving in various officer positions including CFA President. The early years of Black Long Hairs brings to my attention the remarks of the late Mr. Cyril Yeates of England, particularly because he has expressed my own views and experiences. There is no question that the foundation of all our blacks was either English imports or the result of imports, as you will note. The first crop of mentionable blacks appeared about 1936 in England such as the Champions: Chadhurst Barry, Chadhurst Gem, Hillingdon Jackdaw, Basildon Treasure, Dell of Downside, and several others. There were Black Champions prior to these, dating back to 1897 and 1891. It is noteworthy that nearly every good black was the result of a blue and black cross. Our own great blacks verify this. Mrs. Myrtle Shipe played an important role in America’s early blacks of fame. Her imports crossed with blue gave CH Great Lakes Charcoal, one of the most credited studs of all time. From Charcoal came GC Great Lakes Timothy of Rosemont, owned by Frances Kosierowski. 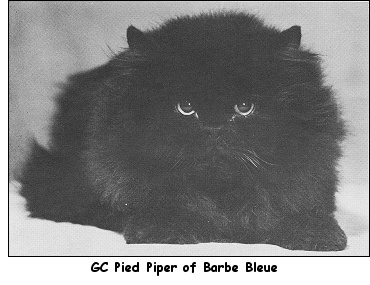 GC Pied Piper of Barbe Bleue, owned by Mrs. Bess Morse of California, has made his impression on the cat world. Certainly he is rightfully thought of as the Grand Daddy of all our blacks. One does not talk of blacks without the thought of Pied Piper coming to mind. The popularity of blacks has been difficult, mainly because the public expects a black kitten to be jet black. Good blacks are anything but. The soft coat that kittens have is never jet or dense in color – usually not until they reach six months or better are they really as shiny and black as we like. There is nothing worse than a poor colored black. Judges will many times put down a top rated type black because of rust or poor coat, yet, we often have seen creams and blues that were spotty or shaded receive top honors, because they carried a wealth of coat. Better knowledge and understanding of blacks have brought them to the foreground and today they are still approaching a high in popularity already exceeding any previous period. Breeding blacks is not easy and takes a great deal of thought in one’s breeding program. Only the best in quality should be used and careful study of the faults must be considered. Keep away from a soft coated black. They will always appear brownish and never will have that glossy black appearance which is so desirable. The hard coat gives the high luster and jet black color. Black kittens are born black, regardless how they change, they will return to being black. Many registered smokes have developed into outstanding blacks. Careful examination at birth is important. History and present day experience prove without any doubt that the best blacks are the result of a black and blue cross, and occasionally black to white will give top results as well. I cannot think of a famous black anywhere in the world that was not the result of a black to blue or white mating. The most difficult cat of all to exhibit is the black long hair. Nothing can be done to retain the dense black coat. Sun, fleas, excessive washing by the cat, and dampness can spoil the color. I recommend you keep them high and dry. Comb frequently and be sure plenty of air gets into the coat, by combing it up from the body, then wipe them with a damp cloth to take the lint off the coat. It is nearly impossible to expect a black to be sound on the belly. After all, they rest on that part most, and the coat is soft and delicate. There a great many fine blacks today. I wish I could write of them all, but some of them are young and their day will come. The late Anthony DeSantis’ CH Longhill’s Black Velvet is to me the finest female cat bred at the famous Longhill cattery. Velvet is truly a grand lady and deserves her days of retirement. Being a grand-daughter to Pied Piper and then mated to GC Lavender Liberty Beau combined not only our East and West, but the finest bloodlines in the world. 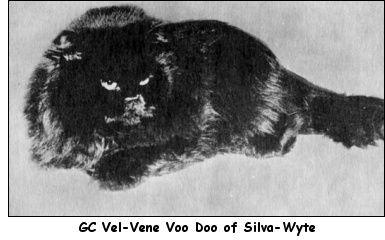 All she had to offer was put into her first and only litter, when she gave a black son who was to traditionally follow the long line of famous sires, GC Vel-Vene Voo Doo of Silva-Wyte. Mr. and Mrs. Robert Green are to be complimented for their contribution to the black cat. Voo Doo is not only a remarkable black, but one of the most perfect cats ever bred. His almost red eyes and jet black coat along with his short body and perfect head are exceeded only by his disposition. Already he has passed on his quality, having a Grand Champion daughter, Black Magic. Another creditable breeder is Celia Heriot with her handsome Precious Le Noir, and GC Victoria of Toi-Reh cattery; such quality is hard to beat. GC Silver Mesa Velvet of Shadow Vali owned by the Harold Webbs is another black girl of outstanding quality. American may well be proud of our black cats for there are no finer anywhere.